They met over drinks after finding each other in an dating website. They clicked instantly and spent the next 5 hours laughing and talking. Chrissy’s first impression was that he looked grounded and trustworthy. Dave thought she was super funny and he couldn’t wait for the next date. And that’s how this playful, fun and happy couple started out into what would be the relationship of their lives. Fast forward a bit, and they found themselves madly in love and ready to plan their wedding! 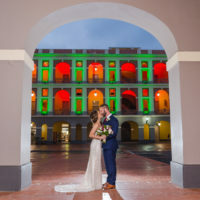 They love traveling and food, and those interests merged together in their Puerto Rico destination wedding at the gorgeous Hacienda Siesta Alegre. The day started in the beautiful Gran Melia Beach Resort in Rio Grande, where both Dave & Chrissy were getting ready along with their wedding party. It was a really hot day! We went out for a couple of cool group pictures of Dave with his groomsmen and, well, a Medalla was necessary to keep up with the weather. Afterwards, lovely and detail-oriented planner Tatiana Ramos drove us to another part of the resort, where all the girls were getting gorgeously ready. I specially loved the mixed bridesmaid gowns, and the hair-dos of the florists. Chrissy is a designer and this came out beautifully in the way she dreamed every part of their day, and the vendors she chose for it. After I shot all the details, accessories, and girls getting ready, we went back to the gardens of the resort, where we would be making their first look. Chrissy was running a bit late, so that gave us the chance to chat a bit with Dave while we waited. He told us of how nerve-wracking planning a destination wedding was, how good Chrissy was at doing all the wedding designing by herself, and how excited he was about the venue they chose. Chrissy started walking toward us, and feelings were all over the place. After they shared a special, intimate moment together, I directed them onto the beach area, where we took some glorious, tropical photos and then got into our cars and off to the Hacienda. Their ceremony had a special glow. They were so beautifully calm, and happy. Like they belonged together from the beginning and tying the knot was the natural next step for them. I think you’ll be able to see it in the pictures. After the formal pictures and everything else happened, a beautiful, Puertorican-inspired dinner & party started –roasted pig and all! I was swooning over the decor, but specially loved the souvenirs; they were mini hand-painted images of different Puertorican scenes. They put together a beautiful experience for their guests and I’m so happy I was a part of it! C&D, I wish you a life full of memories as fun and beautiful as your wedding day was. Hope to have you in front of the camera again! Based in Puerto Rico, Camille is a fan of love stories –and documenting them! capturing authentic love stories of all types, all over the world.